Cooper Tire's technical consultant and performance tire advisor, Johnny Unser, joined efforts with Daytime TV hosts Cyndi Edwards and Jamie Jacobs to help drivers learn simple steps to reinforce the importance of proper tire safety and maintenance. Unser explains how to check tread depth and the importance of tire pressure and rotation. Underinflated tires can waste fuel, cause tires to wear out prematurely and can increase a driver's safety risk. With fuel prices on the rise, simple tire maintenance steps can save consumers gas and money. Cooper Tire teamed up with Good Morning America to film a tire safety segment at the CarFax headquarters located in Centreville, Va., where tire pressure and tread depth was checked on 100 cars. 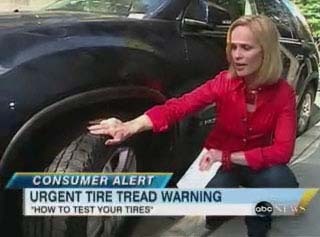 This consumer education piece, which aired June 3 on ABC, was designed to illustrate how many people are driving on improperly maintained tires. Watch as Good Morning America's Consumer Correspondent, Elisabeth Leamy, and Cooper's Performance Tire Advisor, Johnny Unser, interact with drivers while delivering educational and safety-related maintenance tips.